Hasn't performance-making always been collaborative in the literal sense of the term - i.e. a "working together" - because it is a complex art characterised by catalysis (or mutual transformation of the diverse components involved)? It is precisely this working together in the making that distinguishes performance-making from many other of the creative arts; and I have observed that it is precisely this working together to the end of qualitative transformation that makes the identification of artistic signature so delicate in the performing arts - whether the signature artist concerned (whose name stands-in for the (body of) multi-participant work in discursive representations) is Tim Etchells or Ariane Mnouchkine or Rosemary Butcher or Shobana Jeyasingh. We might need to acknowledge here that one of the qualities of the expert performance-maker as collaborator – and of her or his signature - is precisely that ability to attract and exploit the collaborative input, to her or his “signed” performance-making - of another similarly significant and expert practitioner-artist. The key qualifier here, by the way, so often overlooked in the discourse, is “expert”. Yet I am not sure that this undoubtedly characteristic working-together in performance-making is the sort of collaboration that today’s symposium organisers have in mind. I have the sense that on the contrary, the collaborative as they conceive it is a working-together “informed by” what others might call “higher order” and relatively nebulous (but practice-organising) ingredients, such as a shared “ethos”, a shared way or ways of seeing and doing, a shared way or ways of knowing; and it is on the basis of that prerequisite sharing, believed in but so difficult for practitioner-researchers to document or record in the making practices themselves, that the singularity of the individual artists concerned might be productively engaged, might flower – to the end, once again, of a similarly shared experience of qualitative transformation. I am sympathetic to the notion of an “informed” practice, however difficult that “informing” might be to record and, in research terms, to attest to authoritatively; but I am entirely certain that the starting-point to effective collaborations, so often omitted from their account, is expertise and its mutual recognition. body>data>space is a collective based in East London. We are engaged in reading fascinating connections between performance, architecture, new media and virtual worlds. Using our own collaboration methodologies and networked creation processes, the group visions the future of the human body and its real-time relationship to evolving global, social and technological shifts. body>data>space has brought together many diverse sets of artists in process led environments for innovation and experiment, using acknowledged inter-authorship and harnessing the emergent dynamic of collective responses as a key process for creation. We assemble and enable groups, often gathering people from diverse sectors, to explore, share, debate and create ideas together. The Weave – an interauthorship methodology is a creation process where all individuals involved in the process makes a creative contribution as an equal member of a group and shares ownership of the final product with all other creators. developed by shinkansen in 1996) for the majority of its creation projects. It evolves from the belief of a need for wider recognition of the role of interauthorship in the arts and creative industries, and in this way body>data>space continues to examines how interactions between new technologies and creativity have acted as a catalyst for the understanding and appreciation of collaborative processes and exchange in all areas of life. Interauthorship, co-direction, co-production, shared responsibility, collective dissemination, ideas pooling, dynamic emergent futures – reflecting the nature of the projects deep networked process. Anna Teresa de Keersmaeker and Steve Reich share a common interest in compositional structures that set of processes during performance. De Keermaeker started in the 1980ties to choreograph dances to the already composed phase pieces by Steve Reich. It was only 1992 that Steve Reich saw those pieces. He was quite intrigued, how de Keersmaeker's choreography reflected similar compositional structures as he has used in his phase music. While Reich and de Keermaeker became friends over the years and de Keersmaeker choreographed more dances to Reich's music, in most instances Reich's music did already exist. However, one exception is Dance Patterns which Reich composed in 2002 for a film about de Keersmaeker's work by Thierry de Mey. In my paper, I will use Dance Patterns as an example to reflect upon particular compositional processes originating in New York and the New York School that influenced Reich’s minimal music. How does de Keersmaeker reflect upon those processes translating them across not only artistic media, but also across a generation, gender and from America to Europe? What is the common interest in setting up pattern that gain a life of themselves during performance? 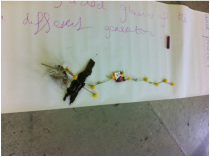 In this presentation, I will draw from Deleuze's philosophy and the performance work of Goat Island to explore the idea of collaboration as immanent authorship; or again, the idea of collaboration as one way in which theatre might tend towards 'immanence' rather than 'transcendence', affirming a primary relationality rather than reinforcing the 'two worlds view' of the subject/object paradigm. In the first instance, I note how the notions of immanent, or bottom-up approaches to creativity might appear directly applicable to processes such as collaboration, devising and collective creation, just as the transcendent, or top-down might be applied to directing and auteurism. However, I will then argue against any straightforward application of the immanence/transcendence dyad to performance, noting that every theatre is always a mixture of both tendencies. Immanence and transcendence are not opposed; director’s theatre differs from collective creation, solo work from collaboration, in degree rather than kind. In particular, I will explore these ideas in relation to the practice of Goat Island - the recently disbanded Chicago-based performance company - who developed a variety of specific approaches both to collaboration and directing across their 20 year oeuvre. Through Goat Island, we find immanence to be the some time product of unlikely strategies, including the imposition of ‘chance procedures’ and ‘creative constraints’. Indeed, we find that immanent authorship is everywhere even in the most apparently top-down ways of working; collaboration is everywhere, even in the one who considers herself a sovereign author. It is all a matter of degree. Given this ubiquity, I want to conclude by exploring why a greater degree of immanence and collaboration might be valued in performance. In particular, I will end by questioning to what extent Deleuze's ethics of immanence might help us to figure out what is 'good' about collaboration - both ethically and aesthetically. This presentation and demonstration introduces Sally E Dean's “Somatic Movement and Costume Research Project” in collaboration with Sandra Arroniz Lacunza and Carolina Rieckhof (costume designers and visual artists). This project aims to create bridges between somatic practices, costume design and performance, thereby instigating new possibilities in all of these fields. The background to our research and methodologies employed will be presented. Using prototype costumes created during the research process, we demonstrate how costumes can be designed to generate specific body-mind experiences – thereby acting as “portals” for fresh kinaesthetic perceptions of oneself and one's relationship to other people, objects and our environment. We outline briefly how somatic costumes can be applied in performance making and creative process. We make particular reference to our recent artist residency at Middlesex University, which explored how the somatic costume methodology offers a new way of engaging in processes of collaboration with particular environments and spaces. We show how we deployed and developed the methodology, and how it has enriched our embodied understanding of the Trent Park campus in sensing its past history and present history-in-the-making. The best of collaborative working allows for two main models to operate: collaboration as contribution and ‘confounding intention’ (Etchells, 1999:55). Within these models rest several modes of practice and different roles, which I will explore in this paper. Collaborative and solo performance making is often construed as somehow separate, as the provocation suggests. This is based on an enduring perception of the dream of democracy that collaborative practice can suggest, as opposed to the supposed autocracy of singular working. I will show how solo working can involve both collaborative models suggested above, drawing on original research material from ten in-depth interviews with five highly experienced group and solo deviser-performers: Tim Etchells, Bobby Baker, Wendy Houstoun, Mike Pearson and Nigel Charnock. I detail some pleasures and problematics articulated by these five practitioners in making work within a solo economy. I go on to explore in close detail some of the modes of collaboration that they discuss when working with others, namely collaboration as contribution, assemblage, co – working and collision. I also suggest ways in which these practitioners collaborate alone: both moving between multiple roles and consciously constructing live performance as an arena in which they enact genuine struggles and find themselves enjoyably confounded. What I therefore suggest is ‘at stake’ in discussions of solo performance making in relation to the collaborative is a long overdue need for theatre discourses in particular to open up the term devising to include solo performance making. To not do so misses out on the very specific contributions this particular economy of making can offer to collaborative practices. Work on the dance production Hiranyala—An Unforgettable Journey began on 2nd February 2012 with theatre studies academic Daniel Meyer-Dinkgräfe providing the initial idea and the story that serves as the basis for the project, working with Gayathri Ganapathy, Bharata Natyam dancer and PhD student in Psychology, as choreographer and dancer. Their collaboration, over eight rehearsals, focused on the first four of a total of eight scenes, and ranged from selection of music to details of the choreography. Bharata Natyam dancer Shrikant Subramaniam, who holds an MA in dance, joined the project in mid-March, bringing to the project not only his expertise as a dancer, but also elements of theatre and story-telling. This further dimension of the collaboration is influencing the choreography in significant ways, to culminate in a showcase performance of the first four scenes on 27th 2012 April to an invited audience. At the symposium, Ganapathy and Meyer-Dinkgräfe will present an analysis of the modes of interaction apparent in this project, between academic and one practitioner, academic and two practitioners, and two practitioners among each other, and the impact of that collaboration on the development of the choreography from solo to collaborative, and Ganapathy will demonstrate that development through live performance of excerpts of the solo work in comparison with video footage of the collaborative performance. Audience feedback will be integrated where relevant. Mariella Greil and Martina Ruhsam use the medium of skype in order to share experiences and thoughts about collaboration while being in two different cities: Vienna and Ljubljana. They discuss the potentials and aporias of collaborative undertakings and talk about commitment, trust and the chance of working together without authorities, consensus and harmony. The artist-driven initiative „Sweet and Tender Collaborations“ of which Mariella Greil is an active participant and Martina Ruhsam´s book “Collaborative Practice : Choreography – the staging of collaboration and its performance” form the basis for their conversation which will mark the beginning of a dialogue accumulating over time to a blog. As an artist-educator, I have been working in the field of creative collaboration for some 25 years. My key publication (with composer Leigh Landy) is Devising Dance and Music: Idée Fixe Experimental Sound and Movement Theatre. The publication illustrated a “flexible framework for devising” that enabled active participation by all involved in the creation and performance of dance and music theatre. The central focus of my current PhD research is collaborative practice in dance, a focus that is very much within the over-arching focus of this symposium. In moving beyond the arts into other disciplines I have noted that apparently collaborative and dialogical approaches may be forms of ‘embodied’ or ‘enacted’ collaboration. In the former, ideal case, the collaboration is owned; in the latter case, it is more artificial. It is my view that through ownership, one can create a truly shared and collective endeavour, whereas enacting leads more towards a more passive co-operative engagement regardless of field of practice. ‘It is about crossing boundaries, entering another space together.’ (Jamieson, 2011, p.37) My research investigates how we enter this space together and the ‘dialogue’ that ensues in the ‘space between’ various discourses. This ‘space between’ is filled with all the individual contributions that make up the whole. As we stated in the Idée Fixe book, it such cases it becomes possible that: ‘… the product is greater than the sum of the two parts’. (Landy and Jamieson, 2000, p.2). This paper investigates how the trend towards collaboration has recently become a major driving force both within the art of dance and the academic discipline of dance studies. The call for collaboration is almost invariably accompanied by a rhetoric about democracy, and hence treated as politically significant. Artistic or academic encounters which permit dialogue are frequently (and often unquestioningly) regarded as democratic in nature, and hence construed in strongly positive terms. Democracy is indeed a major selling point of late twentieth- and early twenty-first-century art, including dance. I will question, however, whether collaboration must necessarily be seen as democratic and therefore desirable, or whether it could instead be viewed as a more problematic corollary of contemporary forces such as globalisation and the modern market economy. My discussion will apply models proposed in the visual arts and other realms which also offer a useful framework within dance studies. Several commentators have noted that devised and collaborative practices (terms often elided) have strong roots and a history of support in university theatre, drama and performance departments. Influential companies have emerged from such institutions. On the other hand, the knowledge economy is being squeezed, not just financially but in terms of allocation of time, expectations of measurable outcome and a culture of transferable skills. What, then, are the continued values of collaborative performance making for our students? What models of practice do we offer and, crucially, why? Have certain companies’ work become (too) canonical? How can the opportunities of the past be secured in the present and future condition of HE? This discussion aims to go some way to mapping the concerns -and solutions - to the risks and opportunities in this vital area of performance making. Rob Vesty has performed in the last two large scale participatory site specific projects of Rosemary Lee, Common Dance (2009) and Square Dances (2011). Together they will discuss the nature of collaboration between performer and choreographer, pondering on their different roles and experiences of the same projects. Their questioning of each other will investigate such issues as authorship, ownership, stewardship and fellowship. How does the ecology of the work emerge through its creation and how can that delicate system then sustain itself within the resulting work and its performance. In these complex projects ensuring a fulfilling experience for both participant and audience member is uppermost in Rosemary's priorities. This balancing act will be considered by participant and director. The conversation will be illustrated by film excerpts of the works running throughout. This paper offers a straight-forward model for analysing ‘who did what, when and to what effect’ within a collaborative performance-making process. 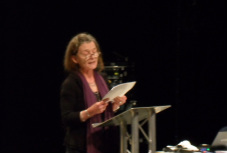 It offers an alternative to what Susan Melrose calls the ‘textualisation’ of the performance event and the ‘writerly’ model of solo authorship associated with semiological analysis (see Pavis), which inadequately account for the transactional, interpersonal and multiply authored nature of rehearsal room practice. At the same time, it provides some analytical rigour for discussing processes (particularly devising processes) that are often characterised through vaguely defined terms such as ‘collaborative’, ‘egalitarian’ and ‘organic’. At Once is a solo by iconoclastic American choreographer Deborah Hay, founder of the Judson Church Theatre in New York and widely acknowledged as one of the most influential representatives of postmodern dance. London-based choreographer and dancer Joe Moran adapted the work over an intensive three-month period before touring At Once to Athens, Toronto and cities across the UK (2009-2011). Deborah Hay rarely demonstrates solutions to choreography. Rather, she conveys her concepts through directives that each performer translates individually into movement in their unique way. Choreographic directives are recorded as a written text, often poetic, that acts as a score for performance. The artist is bound to this material through meditation-like exercises that are applied throughout the choreographed dance. Joe Moran offers a lecture-performance on Hay's radical choreographic approach, performing the choreographic ‘score’ of At Once with brief excerpts and projected images from the dance, offering a compelling insight into the complex thinking behind the work, its choreographic transmission and adaptation. The magician frames his or her performance within a narrative structure that incorporates many elements. These elements combine to confound the spectator's perception of how the physical world really works. But the confusion thus engendered can be a positive one. The magician plays with our understanding of the world, opening up new possibilities in our imagination. I want to look at some of the ways in which a magician can manipulate our understanding of time. The basic elements that create wonder in magic – the appearance or disappearance of objects, transformations, penetrations, restorations and the inexplicable alteration of things – can each be reframed so that they are understood not as the manipulation of physical matter, but as a way in which the performer demonstrates control over the abstract dimension of time. There are many ways in which we can perceive this: a magician who destroys and restores an object can present the process as a demonstration of control over matter, or as a journey into a previous time. The prediction of a card chosen can be presented as coincidence, or as a feat of time manipulation. Awareness of the possibilities of such narrative approaches can transform the magic trick from a puzzle to a piece of theatre. I will look at some of the ways in which this element of the manipulation of time has appeared in the work of magicians both contemporary and historical, relating this to ideas about time as they are presented in the general cultural and scientific context. I will use some examples from video and some live performance from my own practice in order to amplify these ideas. Trio is proposing a performance that takes the form of a self-interview of the collective as a mode of questioning, understanding and performing our collaboration. Deriving from texts which have been developed during and after the creative process at specific points in time (in June 2009 and in April 2012), the self-interview is making explicit a gap in both our personal and collective memory and interrogates our collaborative process through past, present and future times. We will discuss issues arising from our collaboration including the relationship between talking and doing, different modes of communication, misunderstandings and failures, responsibility and decision-making. The members of the collective will be both interviewers and interviewees –exchanging roles and seeking identities. Questioning issues of authorship and non-hierarchical working structures, we are trying to define and organise the fluid boundaries that exist within our modes of production. Seeking alternative ways to work together, we have formed a virtual rehearsal space that acts as a platform for collaborative performance practice (http://triocollective.wordpress.com/). The blog, as a relatively new form of communication and presentation, with all its technological possibilities, is a curious archive. As a document of sorts it flattens the perception of time as a linear development and presents it as fragmented and incomplete. It gives the illusion of Trio as a coherent entity, but is yet to overcome its differences and inconsistencies. Proto-type Theater and MMUle (Manchester Metropolitan University Laptop Ensemble) have embarked on a process of creative collaboration with an aim to produce a new performance work that might be termed ‘opera’. Having been involved in the project as an observer, I am interested here in beginning to explore the ways in which experience translates as aesthetic judgment in a creative collaboration. This project is making particular use of a blog to create a memorial document of place and time; of particular interest is the performers shifting relationship between what, for some participants, might be experienced as an ‘interested’ position in the rehearsal space and a ‘disinterested’ position created by the blog that defamiliarizes the materials and creates a space for aesthetic evaluation. In addition, this paper assesses issues that those involved in the project have experienced such as the challenges of finding a shared vocabulary, conflicts occurring between a desire for spontaneity and the time needs of technology, and identifying a performance language and aesthetic. The paper will also address the effectiveness of strategies for collaboration, particularly, working with naivety, ‘collisions’ (a term derived from Heiner Goebbals) and displacement. Is to speak of “collaboration” not simply to describe – however critically - but rather to try to identify something qualitatively distinct in the process of making performance? What might distinguish “collaboration” from the simple fact that any performance involves testing relations with the skills, temperaments, and imagination of others – not least, those of an audience? What makes this specific – distinct from being simply opposed to the straw man of hierarchical direction (whether as given or received), associated with institutional economies of performance making? In the division of labour that is theatre, what does reference to “collaboration” aspire to make known? Should we beware of the academic researcher, clinging to the zombie of the solitary “producer of meaning”, wishing to find new bodies to ventriloquise? Is “collaboration” an encounter with what transforms fantasy into work? With what confronts us with a question as to what it is that we want from this work, not least as the work of - and with - others? Perhaps a “collaborator” might be material rather than personal – a piece of wood or an editing programme, rather than a designer or a dancer: not just I-you-we, but it? Is the question of “collaboration” more than that of what one cannot do by (or even for) oneself? Collaboration suggests an active participation – although should we not be wary of supposing that the distinction between active and passive is either instructive or intelligent (especially as concerns an audience)? Is not the production of meaning, the making of sense, collaborative? After all, at the moment while I am speaking you are listening (although, of course, your thoughts might be quite elsewhere). We are doing something together, but differently. Without your listening I would be simply talking to myself – which I am too, of course. Is it only a cheap rhetorical trick, then, to suggest that rather than talking about collaboration now, we could be practicing it? That we could be already learning through it - amongst ourselves - if not immediately, then perhaps retrospectively? This paper will discuss the (dis)location of time and space as experienced whilst working with Japanese theatre company Gekidan Kaitaisha, reflecting on how time and place are integral to performance-making processes and on how the distributed performer self might operate as part of a complex networked system. I am interested in asking how we can diagrammatically map composition, how we can account for the body in the performance space, and more specifically how I can account for my body – or performer self – in Tokyo. Drawing on my recent collaboration with Kaitaisha in Tokyo (February 2012), I will discuss ‘time’ in terms of a non-linear temporality or ‘unhinged time’, duration within the performer body (in Bergson’s terms), repetition as central to Kaitaisha’s signature practice, and how time is theorised within the themes of the performance. I will reflect on time in relation to the making process and to how I experience the space of Tokyo in terms of pace, and as a culturally specific location where I operate as both ‘insider’ and ‘outsider’. I will focus on my perspective and interpretation of Kaitaisha’s practice through my own cultural ‘gaze’, through (mis)translations, and through my status in the making process. I will briefly draw on Cilliers and Knorr Cetina to locate what I would describe as the ‘distributed actional performer self’ that operates as part of a network within the collaborative process, in an in-between transcultural place, and I will argue that this ‘self’ is transformed by the time and place of the action.